One of the things that was extensively changed in Solr 6.0 are the Streaming Expressions and what we can do with them (hint: amazing stuff!). We already described Solr SQL support. Today, we’ll dig into the functionality that makes Solr SQL support possible – the Streaming Expressions. Using Streaming Expressions we will put together a mechanism that lets us re-index data in a given Solr Collection – all within Solr, without any external moving parts or dependencies. Of course, you don’t need to use Docker, but this is the simplest way of getting an environment independent installation for the purpose of this post. We used the MYSQL_ROOT_PASSWORD property to set the root user password, which we will need to connect to MySQL. Of course, we will be using Solr 6 and its cloud mode – SolrCloud. However, before we start the instance we need to put MySQL JDBC driver in the lib directory of our Solr server because we will need to connect to MySQL from Solr. You can download the driver from https://dev.mysql.com/downloads/connector/j/. Apart from starting in the cloud mode (that’s what the -c switch is for) we’ve set the solr.autoSoftCommit.maxTime to 1000, which means that the Solr soft autocommit will be sent once every second, just for near real-time visibility of search results. We also use the embedded ZooKeeper instance, which is enough for our test (available on the 9983 port by default). To keep things simple, we will use one of the configuration sets provided with Solr – the “data driven” example, which we can also call schema-less. It will add fields we need, so we don’t have to worry about the index structure and concentrate on other things. As you can see our Solr was able to connect to MySQL, retrieve the data and return it. These documents wouldn’t be indexed. That’s because we’ve run the update streaming expression only once and we need something running periodically and doesn’t force us to do that manually. We defined the identifier of the daemon (using the id property), which we can use to control this functionality. We also specified the runInterval and the Streaming Expression that will be run every runInterval milliseconds. As you can see, the two new documents were indexed and the _version_ of the two previous ones changed, which means that the data was fully re-indexed. The nifty thing is that we can control and check the execution of the daemon we’ve defined by using a set of API calls and the specified identifier. As you can see, we have a single daemon instance running inside Solr. 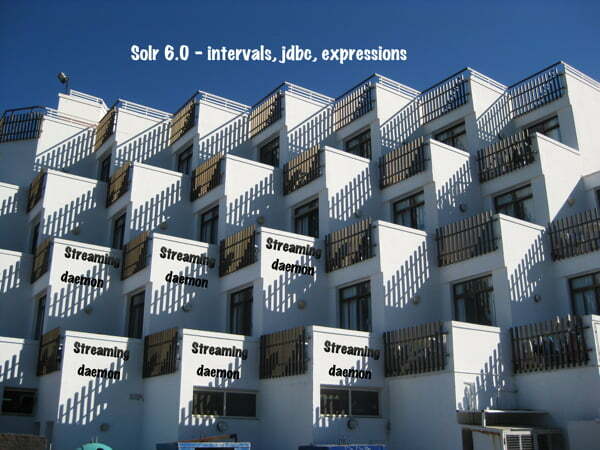 Interested in Solr Streaming Expressions? Subscribe to this blog or follow @sematext – we have more Streaming Expressions blog posts in the queue. If you need any help with Solr / SolrCloud – don’t forget @sematext does Solr Consulting, Production Support, as well as Solr Training!